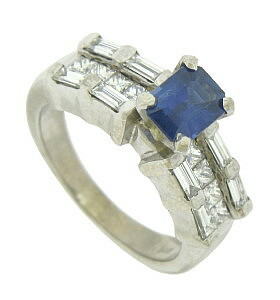 A rich blue emerald cut sapphire rises above the 14k white gold band of this estate engagement ring. The wide band is adorned with a string of square cut and baguette cut diamonds. 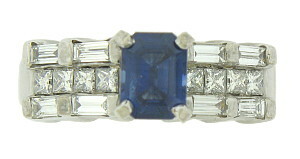 The estate ring measures 7.27 mm in width. Circa: 1950. Size 7 1/2. We can re-size.